About two years ago I had to start taking a break with my gardening because of trouble I was having with my foot. I started a garden several years ago on a whim- I got a few little potted plants from Home Depot and put them next to our pool on our screened in lanai. Then I caught the gardening bug and started planting seeds, creating little planters, etc all around our pool and inside the lanai. It was a tremendous source of joy and interest for me. But then I had the trouble with my foot, and had to take the break. Anyway, gardening is tricky in those conditions, as you can imagine. 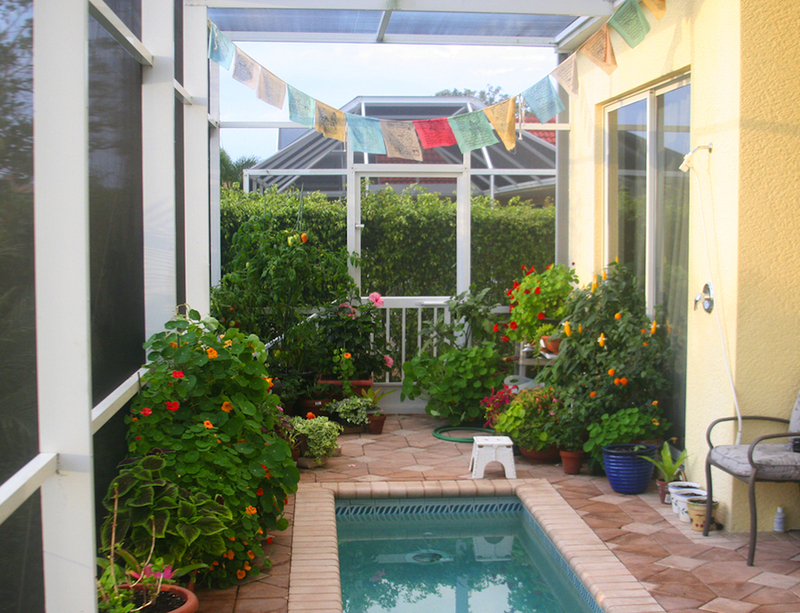 I used to water and garden before I got in the pool, being careful to limit my time and then using the chlorinated water during my swim as a way to get rid of any soil or anything else that might be on my feet. When the screw started coming through my foot, Tom sort of took over the garden to help me out. But then while I was recovering from surgery, he discovered that a Gulf Frit (a butterfly) had somehow managed to get inside our lanai and lay eggs on one of our plants, and we had a bunch of caterpillars munching away. We decided to leave them be because we had no place to safely transplant the caterpillars to- they eat specific types of plants, so if you move them to a plant they don’t eat, they will starve and die. 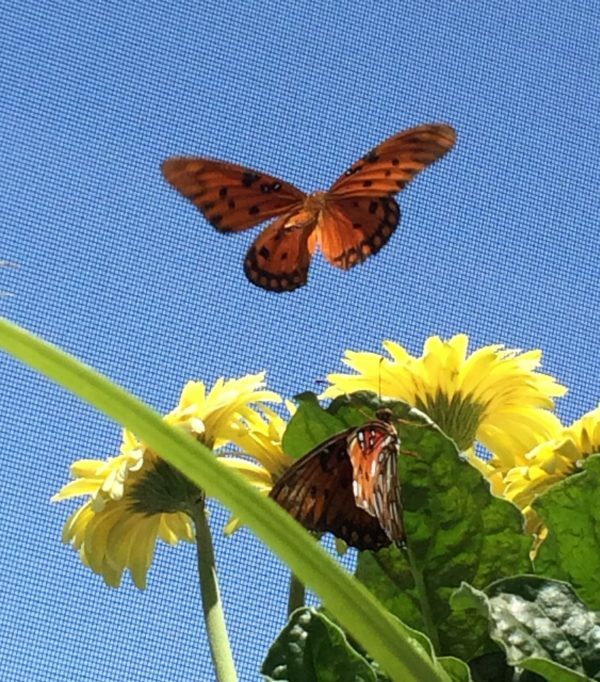 A few weeks later we had butterflies *inside* our screened in lanai, and they started laying eggs… so Tom decided to turn the screened in lanai into a butterfly haven. In time, all my ornamental “fun” plants were shifted out or given away so that we could dedicate the very limited space to host plants for the caterpillars to eat, and nectar plants for the butterflies to drink. We had several vines twined up the screens, and it was kind of this beautiful oasis of flowers and wild plants and butterflies and caterpillars all over. But right before Hurricane Irma hit us, it all had to be dismantled- all the vines cut and pulled off the screens, all the plants moved into the garage so they wouldn’t become flying missiles during the 150 mph storm, and all the butterflies and caterpillars released so they had a fair shot of getting shelter and wouldn’t die in the garage if there was flooding or we couldn’t get the plants back out immediately (and it did take a while). Because of the damage of Irma (all our screens were torn on the lanai) and the fact Tom was recovering from cancer surgery (no heavy lifting), a lot of the plants had to stay in the garage longer than we would have liked, and they either went dormant or didn’t make it. Tom gave a lot of them away to the guy who does our landscaping- he helped us before and after the storm and he had a use for a lot of the plants we had, so it was a great opportunity for us to let go of those plants while neither of us could move or care for them. We did keep a few plants, and they are outside the lanai so caterpillars and butterflies can make use of them while we can’t have a garden. I have been patient for a few weeks, but I’ve realized that I DESPERATELY miss the garden. So much. It feels like a major source of small joy is gone from my days and swimming bores me to tears without the garden to swim alongside- I miss the colors and shapes and lizards that lived in the plants. Tom is still recovering from surgery and is not ready to start doing butterflies again- he missed quite a bit of work due to the diagnosis/surgery/Hurricane Irma, so he’s crazy busy. Plus, he’s trying to not overload himself to keep his stress levels down. The butterfly garden is too much work and responsibility for me alone- it’s one level of responsibility if it’s just plants, which I kind of feel hugely committed to anyway, but when you add in live creatures, skipping a day of care is just not optional. Plus, most nectar and host plants are actually bushes and small trees, so hauling around those huge heavy pots and planters is not something I can do with practically no balance and a foot that needs to have pressure kept off it as much as possible. So after thinking about it a bit, I decided to go ahead and start from scratch like the way I did wayyyy back when I started the garden: easy and fun ornamentals and fun plants that only need small containers (so I can move them around as they need) and a little bit of care but provide color and lots of leafy greens. We still do not have screens on the lanai, so who knows when we will be able to raise butterflies again. But I am looking forward to getting back to planting little pots (most of my old pots are gone - also donated) and keeping an eye on the seeds and watching plants develop and grow and eventually bloom. Since I haven’t made a garden order in forever, I splurged and bought myself a bunch of seeds from Swallowtail Gardens. I also added a few vining plants that would eventually be good as nectar plants for the butterflies when we get them going again. Tom and I will go to Lowe’s or Home Depot sometime this week to stock up on new pots and potting soil. Maybe a few plants, too- we’ll see because all the local stores around here use heavy pesticides, and we need to keep the garden organic for the butterflies. But it would be nice to have a few plants just to start with. I know it will take a few months, but I’m feeling excited about it. Wahooo! I’m glad you are getting back into gardening. I miss our Sprout Dispatch days! I love reading this! I love how much you love having a garden. The joy comes through in your writing and even brightens my day from miles away. I look forward to seeing how it all comes together again.